Step into style! 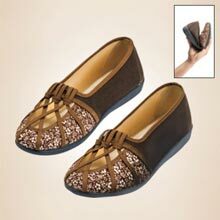 The perfect combination of comfort and fashion, these easy-wear Floral Lattice Loafers feature chocolate criss-cross ribbons that create the unique open top design, while a charming floral pattern accents the toe. Perfect with jeans, slacks or shorts! Polyester with non-slip sole and reinforced heel. Imported. Available in whole sizes.